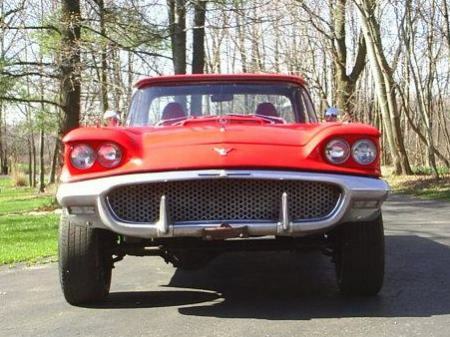 What happens when one mixes a 1958 Thunderbird and a 1977 Chevy Blazer 4x4? This goofiness. What this crazy world really needs is a 450 horsepower, Chevy powered, four wheel drive, Ford Thunderbird pickup truck, right? According to the auction, "If you want to stand out among the crowd in a one of a kind creation that looks great & sounds great, this is it." Hard to argue with that. Also, it's good to know that the 4WD actually still works. Nothing worse that taking your vintage Thunderbird out on the Rubicon only to get stranded in some mud pit or on a boulder by non-working 4WD. Oh, and it can also be used as a tow vehicle. In fact, "The previous owner had a lawn service so he pulled a trailer with mowers in it." Imagine that. This is a test. Pay no attention to the man behind the curtain. Was the square bird always a four wheel drive? My Dad built a two wheel drive version back in 1969 and I'm trying to track it down . It was black with a gold lace pattern on the back of the top. At the time I was 4. I've always wondered where the car ended up. I have no idea the history of the car. I saw it on eBay 5 years ago. I'm not even sure where I saw it originally.